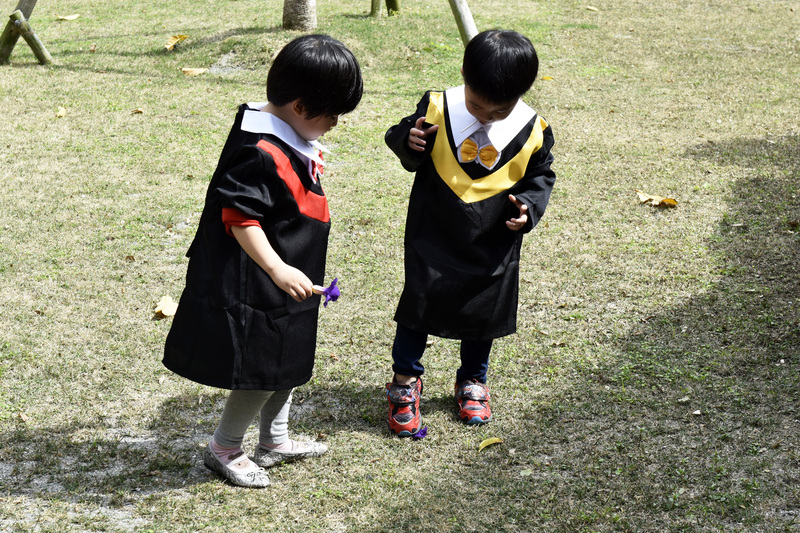 The Okinawa Institute of Science and Technology Graduate University (OIST) held its inaugural Graduation Ceremony on February 24, 2018, to celebrate the achievements of OIST’s very first graduates. 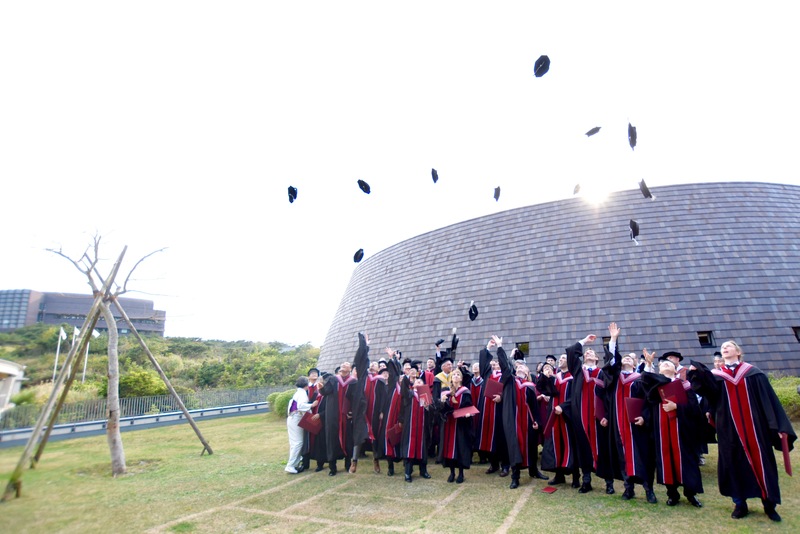 This occasion is testament to the dedication and hard work of OIST’s students, staff members and founders and proves that, in just six years, Japan has established an outstanding new university for world-class international scientific research in Okinawa. The Graduation Ceremony took place on Saturday afternoon. 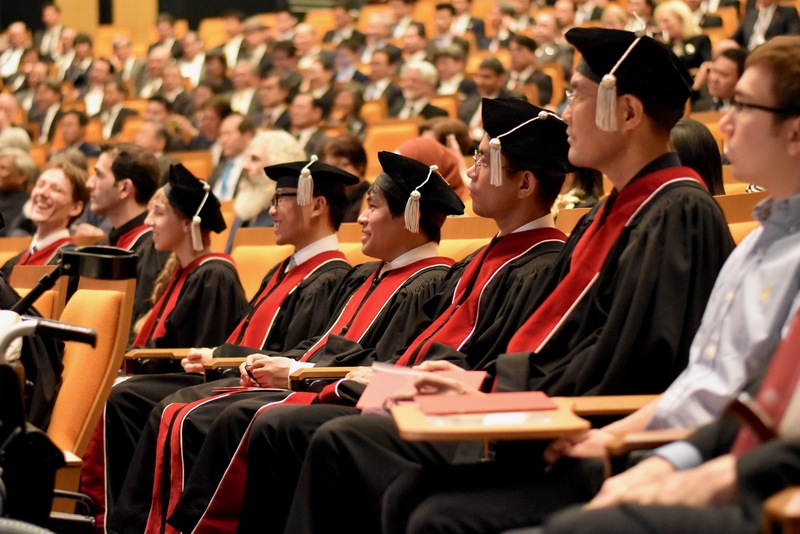 About three hundred people attended the ceremony in the OIST auditorium to celebrate the success of the fourteen graduates, who completed their PhDs in a diverse range of subjects from quantum physics to marine genomics. The audience included family members of the graduates, as well as representatives of Japanese and international academia, industry, and government. OIST president Peter Gruss gave a welcome speech and introduced the special guests. The graduates in their academic dress during the ceremony. 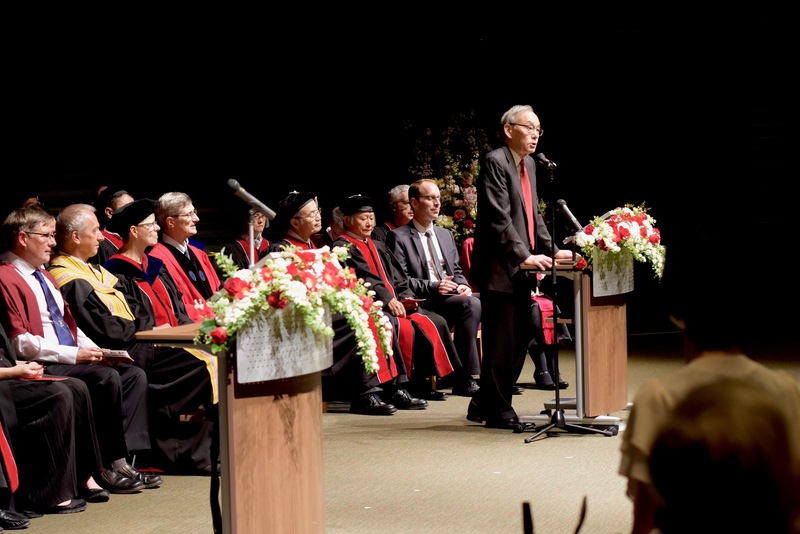 Dr. Steven Chu delivered a thoughtful and motivational speech to the graduates. After a short break and a musical interlude came the conferment of the PhD degrees. The graduates came up one by one and were introduced by their PhD supervisors, who each took an original approach to the introductions. For instance, Professor Thomas Busch introduced Dr. Lee James O’Riordan with a poem, while Professor Sile Nic Chormaic introduced Dr. Mark Daly with a limerick. 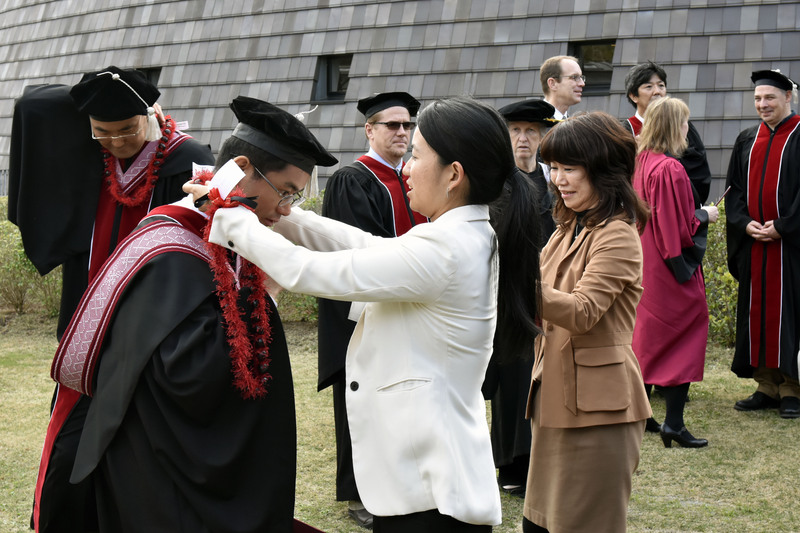 After being introduced, the graduates received their hoods, which featured a local textile, called Yuntanza Minsa in OIST colors of red, white and black. The design of the hood, hand-woven with locally hand-dyed cotton from a craft weavers’ guild in Yomitan, combined local auspicious patterns for luck in money and life, and stylized sine waves representing the sciences. Dr. Caroline Starzynski, graduate from the G0 Cell Unit, spoke on behalf of the graduate students. She said that the most essential trait to surviving a PhD studentship is persistence, to keep going despite difficulties and hurdles. She summarized the characteristics that an OIST graduate will take with them when they leave OIST, “We are certified problem solvers, critical thinkers, time and even conflict managers, equipped with reasonable skills to convince.” In the last part of her speech, she addressed the people of Japan in Japanese, proving the multitalented nature of the OIST graduates, many of whom raised families and learned Japanese on the side of their studies. Dr. Caroline Starzynski spoke on behalf of the graduate students. As part of the ceremony, OIST awarded its first ever honorary degree to Mr. Koji Omi, who first had the vision to create OIST. 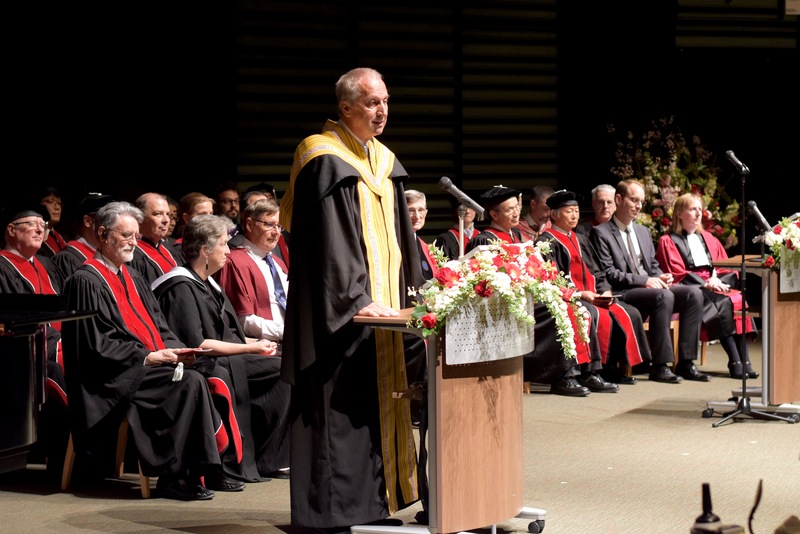 In a speech for Mr. Omi, Peter Gruss acknowledged that, “without his visionary leadership, OIST may never have been built.” Peter Gruss went on to praise Mr Omi’s courage, selflessness and strength of character, qualities which equipped him to break the traditional mold of the Japanese University system and start a new, unique university from scratch. The graduates celebrated after the ceremony. 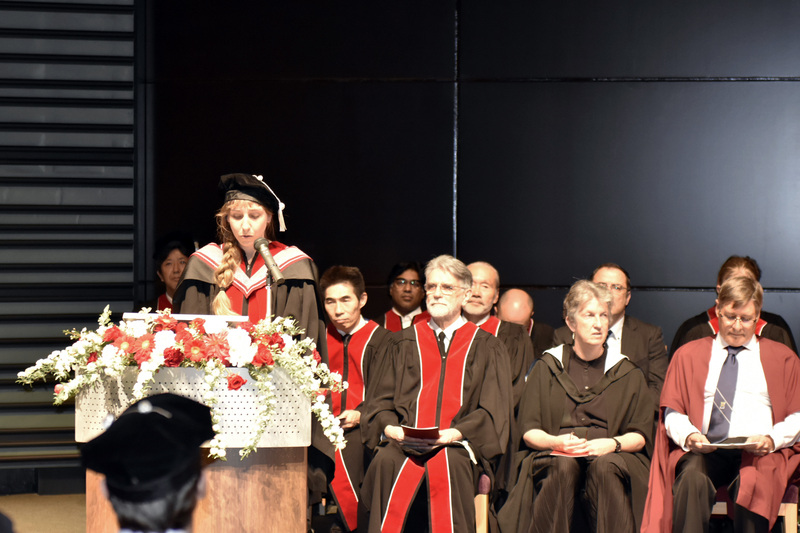 The ceremony closed with a musical finale followed by the Academic Procession, in which the graduates walked out into the February sunshine to rapturous applause. The graduates received traditional Hawaiian neck garlands called ‘lei’, made from candlenuts, after the ceremony as a gift from Robert Nakasone, an OIST Board of Councilors member from Hawaii. 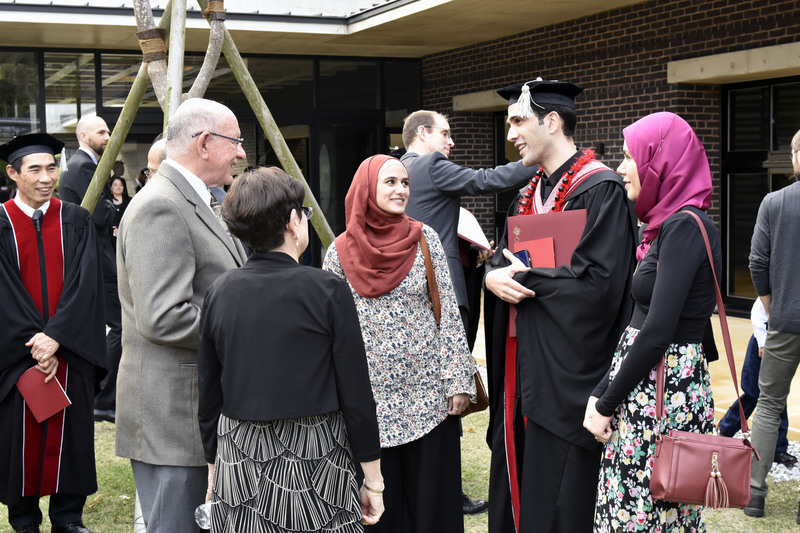 Dr. Zafer Hawash speaks with former OIST president Jonathan Dorfan and his wife, Mrs Renee Dorfan, after the ceremony. Family members attended the Graduation Ceremony. These little guests joined in by wearing mini gowns. This was a very special day in the history of OIST Graduate University. Congratulations to the graduates and may they enjoy every success in their future endeavors. 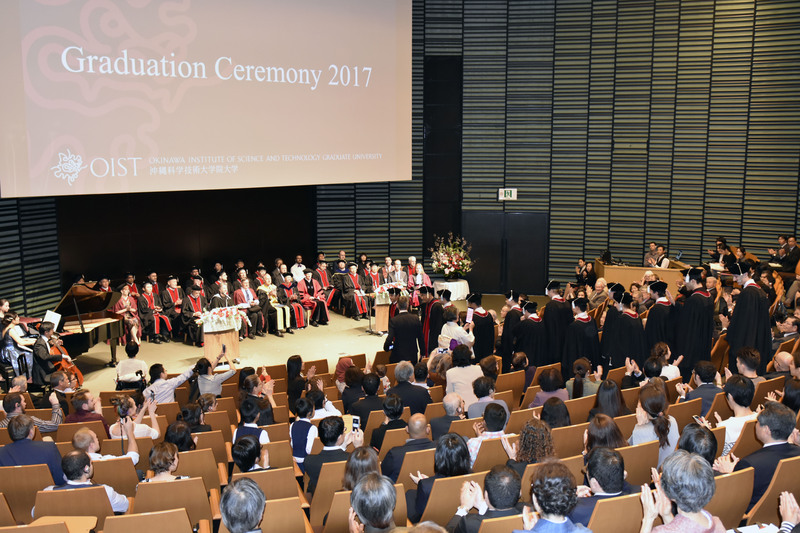 To see more photos from OIST Graduation 2017, click here.